Is the $40 Starbucks January 2016 Refill Cup A Good Deal? UPDATE 1/10/17: this is back at the Starbucks website, going for $28! Shipping is extra unless you participate in a free shipping promotion (eg orders over a certain amount or something else). Note that if you buy it, it will take a few days to arrive, so if you are doing the math on how many free drinks it gets you, factor that in. The original post below is for the January 2016 $40 coffee cup which was available when the old Starbucks rewards program was running. 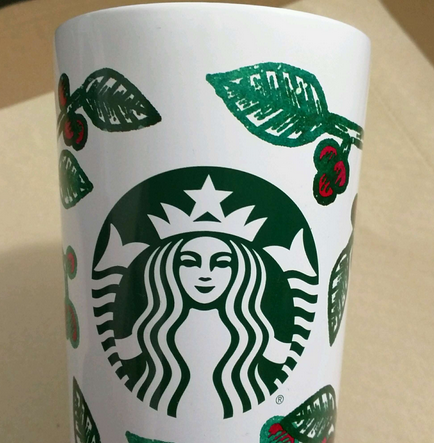 The January 2017 cup is now available [as of late November 2016] to purchase at the Starbucks brick and mortar stores along with the Starbucks website. Now that we have the new rewards program, this is an even better deal, because you get 80 Stars (2/3rds of a reward) on the purchase of the cup ($40 times 2 stars) instead of the previous one star (which was 1/12th of a reward). Not only that but if you wait for a Bonus Stars promotion, you can get 160 Stars with the purchase of the $40 cup. That’s 1.28 rewards on the purchase price alone. Without factoring in the reward math, the straightforward cut-off point is this: $40 divided by the price of a cup. $2.45 if you don’t bring your own cup, or $2.35 if you bring your own cup and get the 10c discount. $40 buys you 16 to 17 cups. So if you are going to be at Starbucks more than 17 different days in January 2017 AND buy a coffee or tea (no fancy drinks qualify), this is a no-brainer. The above is before you factor in the value of the cup, which is probably somewhere between $10 and $20. Since the rewards program is a factor of the price paid, it tracks the other parameters above. The PSL may be the most famous of the Starbucks Holiday promotions but it’s only one of many. One lesser known promotion that they run during the holidays is the January cup. 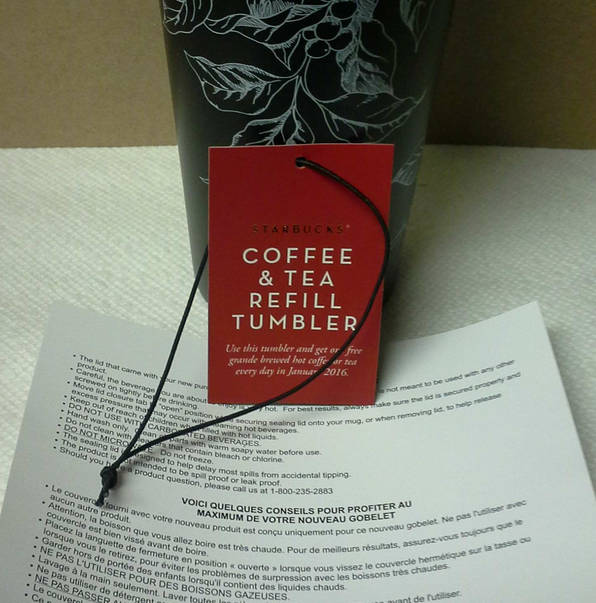 You pay a fixed amount of money ($40 + tax this year) and you receive a coffee cup that entitles you to one grande (= 16oz) brewed coffee or brewed tea PER DAY during the whole month of January 2016. That’s 31 days of free 16oz drinks. This is only brewed drinks, you can’t get free lattes or mochas or fraps. Just good old coffee and tea 🙂 Customizations are extra, and Reserve coffees and Oprah Chai Teas are excluded. As you can see in the pictures below, this is actually a nicely designed cup, modest and stylish at the same time, without it being obnoxious. You can easily use this all year round. It does not scream holiday cup. You get the cup, the lid and instructions. If you are a Discover credit card member, we have some news for you. 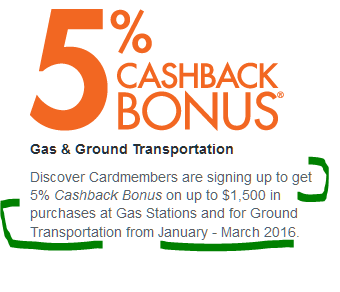 Discover has official revealed the 5% Cashback Bonus categories for the first quarter of 2016. These promotions run from January 1st until March 31st. You get 5% cashback on gas stations and ground transportation purchases. Gas stations are fairly self-evident, but they include a long list of examples, including Shell, Texaco, 76, BP, Chevron, Exxon, Conoco, Philips 66 and many more. That list is just examples, it is not an exhaustive list. Basically if a gas station is properly registered with Discover, then it should count. If you are not certain, just make a fillup and wait for your next statement. Or call them. The ground transportation (see above) is a welcome addition for people who don’t have cars or who don’t drive a lot of miles. They include most of the basics, rental cars, buses, trains, taxis, and also Web 2.0 taxis (Uber, Lyft). Tour buses and charters are also eligible however, they must not be purchased through travel agencies and other similar services. As usual, the limit is $1500 per quarter per credit card. If you spend more than $1500, the amounts over $1500 will earn the standard cashback rewards like any other purchase. PS: if you are using Apple Pay, these purchases should register as well for the 5% cashback. If you are a member of the Lucky Rewards program, check your email inboxes! 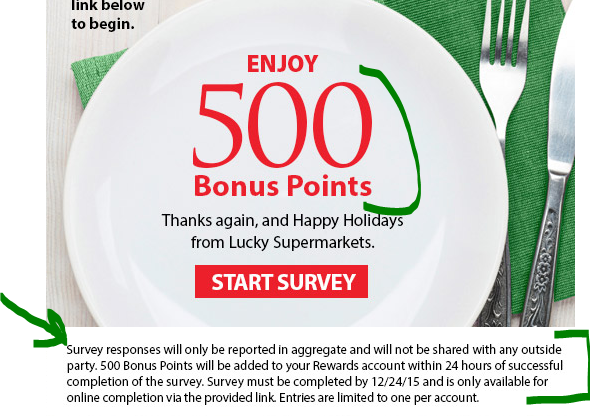 They have a promotion that gets you 500 Bonus Rewards Points if you complete a survey. The only way to do this is using the link from their emails. This is a limited time promotion. The points will be added within 24 hours of survey completion. Their text, as you can see highlighted in the screenshot above, says the results will not be shared with outside parties. I haven’t done the survey yet, so I don’t know what kind of questions they ask. If I ever get around to completing the survey, I will update this post. 500 points is a respectable amount. That’s $5 off a Lucky’s purchase. You can also use your points towards free items that change every few days, but typically you are better off taking the $3 off (300 points) or $5 off (500 points) or $10 off (1000 points) and so forth, since you can use them to buy what you actually want, versus using them up on random reward items. The only exception to that is if the reward item is available at a better “points price” versus the actual in-store price. If you live or happen to be near a Peet’s brick and mortar coffee shop on Saturday December 12 in 2015, you can enjoy a 20% off sale on select coffees, teas, and gift items. Eligible items include their Holiday Blend beans (regular or decaf) and K-Cups, and their holiday teas (Holiday Breakfast Blend, Winter Solstice, Vanilla Bean Pouches, Chocolate Mint Truffle Pouches, Vanilla Keemun), and some gift items. The offer is not good for drinks or bakery food items. No coupon is needed, the sale price will be factored in automatically within the stores. These type of offers are typically only good at retail locations, not some of their more express store-within-a-store locations. If you like to try out new loose-leaf teas without breaking the bank, this is as close to a free online sample as it can get realistically. 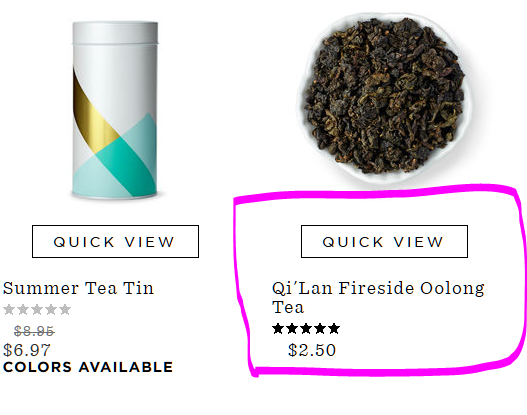 Teavana is offering 2oz of their Qi’Lan Fireside Oolong Tea for $2.50. You can buy it in multiples of 2oz or get 1lb for $20. Their website has free standard shipping on all orders until 12/23/15. This tea averages 4.8 out of 5 based on eight customer reviews. And this is just tea leaves, no other ingredients. Steeping instructions are included on the above page. Their recommendation is 3-5 steeps, so this is quite the bang for the buck tea considering the price, and the fact that this is actual real tea leaves, not a blend of tea leaves and various fruits and vegetables and spices [meow!] 🙂 So if you are a tea purist, this is a hot deal! As you can see from the screen-shot above, this is part of their Sales promotions, which includes a few other teas that go for under $5 per 2oz, and those are flavored/desserty teas.